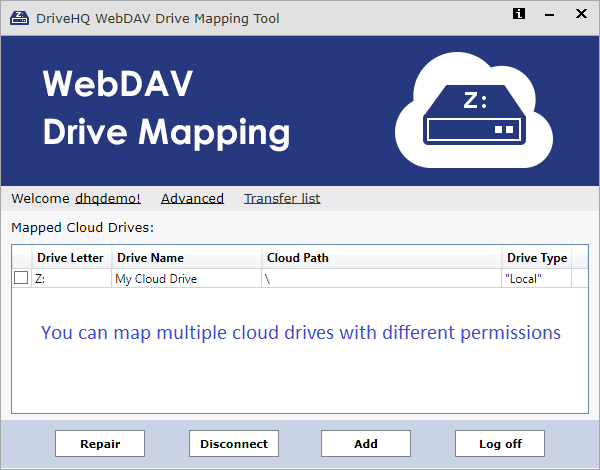 To map cloud storage as a local drive, please download WebDAV Cloud Drive Mapping Tool. To drag-n-drop huge amount of data; directly edit & save cloud files; synchronize, share & publish folders, please download DriveHQ FileManager. To automatically back up files in the background, please download DriveHQ Online Backup. DriveHQ FileManager 6.0 - Drag and drop, folder synchronization, online sharing, edit remote files and directly save back. Works like Windows Explorer. It cannot be easier! Works like remote file server or FTP Server; upload/download thousands of files, gigabytes of data as easy as 1, 2, 3; automatic folder synchronization; remote sharing with access control. DriveHQ WebDAV Drive Mapping Tool 4.2 - Map DriveHQ cloud storage as a network drive. completely replace your local file server! Drive mapping is the most straight-forward way of accessing cloud storage. You can map DriveHQ cloud storage as a network drive without installing any software, and it works on any platform. This tool makes it extremely easy to map a Drive on Windows PC. DriveHQ Online Backup 6.0 - Easy, secure and reliable online backup. Runs as a background system service. Set and forget, save time and money. Automatically backup your files, emails, databases & servers online. Much safer than your own backup solution! No need for backup devices. Backup multiple PCs with no additional charge! DriveHQ Email Manager 3.1 - Drag-n-drop backup emails and contacts to DriveHQ Webmail, view or restore emails without full restore. Much more efficient than Outlook PST backup. The first software that can manage your emails & contacts like files, drag-&-drop or automatically backup your Outlook / Outlook Express / Windows Mail in real-time or scheduled times. It can also help migrate your emails & address book from one computer to another computer. Almost all enterprises use Active Directory service. Active Directory is used to manage accounts, groups, resources and control access rights. 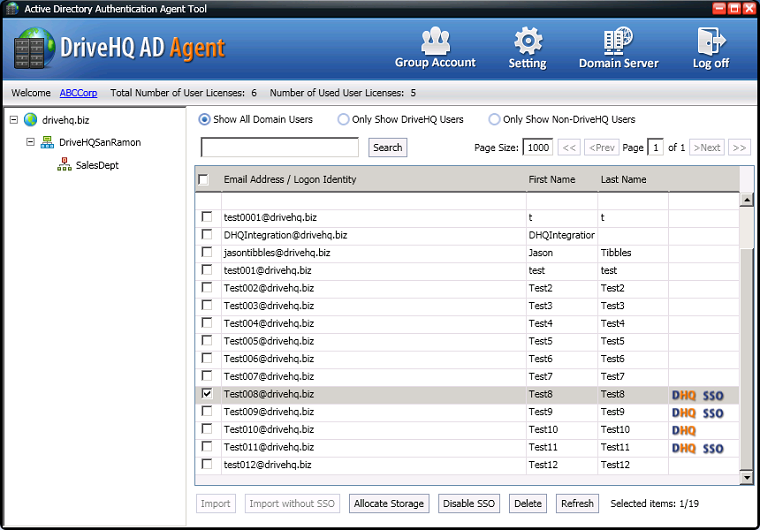 With DriveHQ Active Directory Integration Agent, Enterprises can easily import thousands of users into the DriveHQ system. 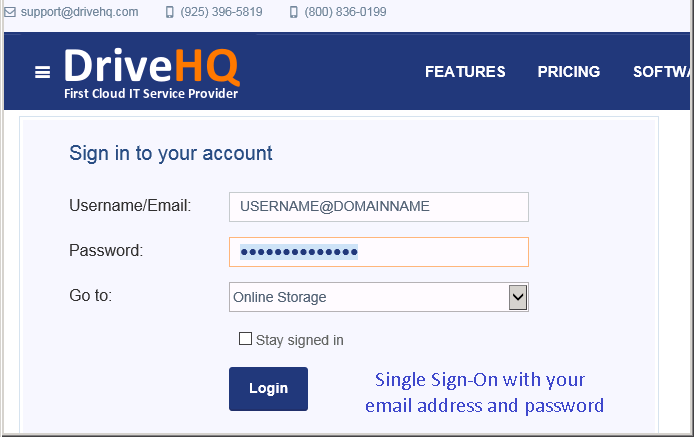 Users can logon to DriveHQ system using their domain email addresses and passwords. DriveHQ FileManager for Mac 2.2 works like FTP. It requires no configuration as it is seamlessly integrated with DriveHQ.com. You can easily drag-n-drop upload/download large files and folders, share files/folders to different users with different permissions, and access your files from Mac, Windows or any other devices. DriveHQ Cloud Drive Mapping Tool for Mac - Map cloud storage as a network drive. Directly edit cloud files in Finder. Cloud Drive Mapping Tool for Mac 1.3 makes it extremely easy to map a cloud drive on Mac. Just enter a cloud path (or use the default root folder), and click Map, it will create a new drive in Finder. 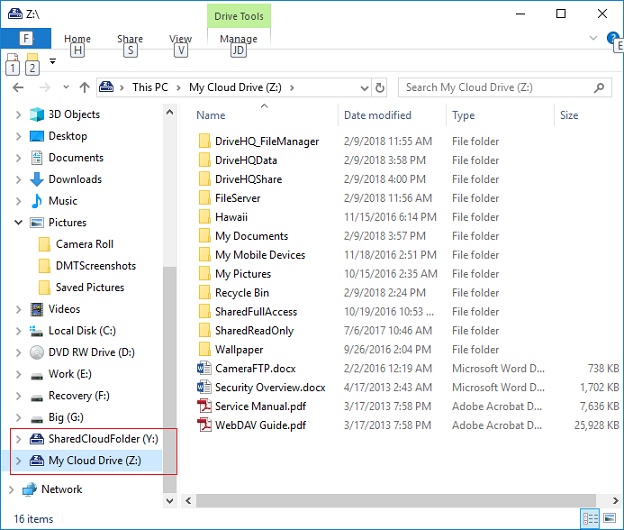 You can directly edit cloud files as if they are on your local drive. DriveHQ Online Backup for Mac - Automatically backup your data online. Easy, secure and reliable. No device needed. DriveHQ Online Backup for Mac 2.2 can automatically backup your files/folders to DriveHQ secure offsite datacenter, which is much more reliable and safer than your local backup. Besides, you can access your files from anywhere, at anytime. You can backup multiple MACs for no additional charge. Using DriveHQ.com website and PC-based software, you can easily transfer / share files between MACs and PCs. FTP is designed to reliably upload / download large amount of data. Most FTP clients support drag and drop files / folders. You can use any FTP client software connecting to DriveHQ's FTP Server with your DriveHQ username & password to log on. Use the default port number (21, 990 or 22). Remote directory is not required; you can create any directory on DriveHQ. For more info, please visit: Configure FileZilla with DriveHQ FTP. Cyberduck is a free FTP client with an easy to use interface, integration with external editors and support for many Mac OS X system technologies such as Spotlight, Bonjour, the Keychain and AppleScript. FileZilla is an excellent free FTP client that is available on many different operating systems. It doesn't have advanced sharing, publishing, automatic backup and folder synchronization features as offered in DriveHQ client software. FileZilla works very well with ftp.drivehq.com, offers a complete FTP hosting solution. DriveHQ FileManager is available on iOS (iPhone/iPad), Android and Windows Mobile platforms. On all platforms, you can manage cloud files and folders, download or upload files, view images on your cloud storage, share folders with granular access control, or create drop box folders. You can view/open Microsoft office files, PDF files, image files and more. On Android, iOS and Windows Mobile platforms, you can also use any FTP, WebDAV and Email apps. For more information about how to configure FTP, WebDAV or email on those devices, please visit DriveHQ Online Help.